A cross-linking map used to analyze protein-protein interactions. Each bar represents a protein sequence. The red and blue lines represent detected cross-linked species. 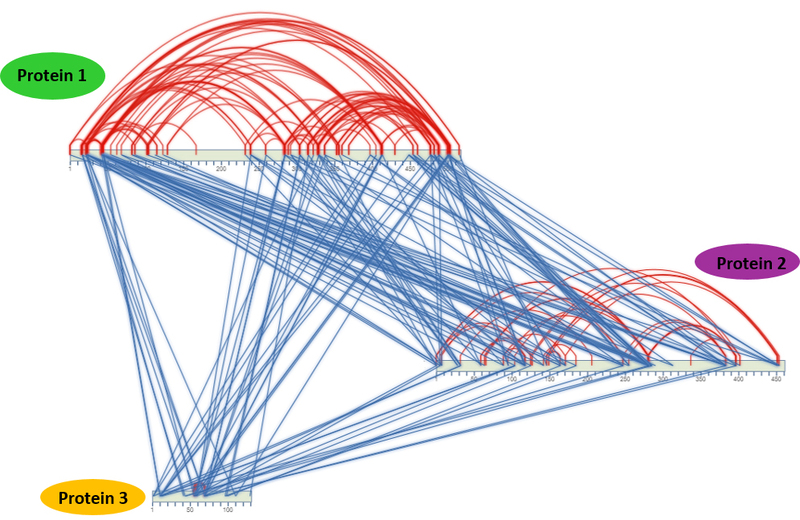 Inter-protein cross-links are represented by blue lines, and intra-protein cross-links are represented by red lines. Image courtesy of Monika Tokmina-Lukaszewska. Imagine you wake up in the middle of the night with a great thirst. To quench your thirst, you have to get up and go to where the water is. Without being within the correct distance to get water and facing the correct way to drink the water, you will be unable to quench your thirst. Chemical reactions that occur every second of every day are no different. For these reactions to occur, each component needs to be within the correct distance and orientation of one another. To study various reactions and biological processes, scientists need to understand how reaction components interact with one another, and how a variation in these components can improve or hinder a reaction. A solution to this problem is a technique called chemical cross-linking. Chemical cross-linking uses a molecule, called a cross-linker, to connect two components in a reaction. Think of a cross-linker as a piece of string with tape on either end. The piece of string varies in length, allowing scientists to control how close the two components need to be for cross-linking to occur. Additionally, the “tape” on either end of the string can change to influence what part of a reaction component is stuck to the cross-linker. 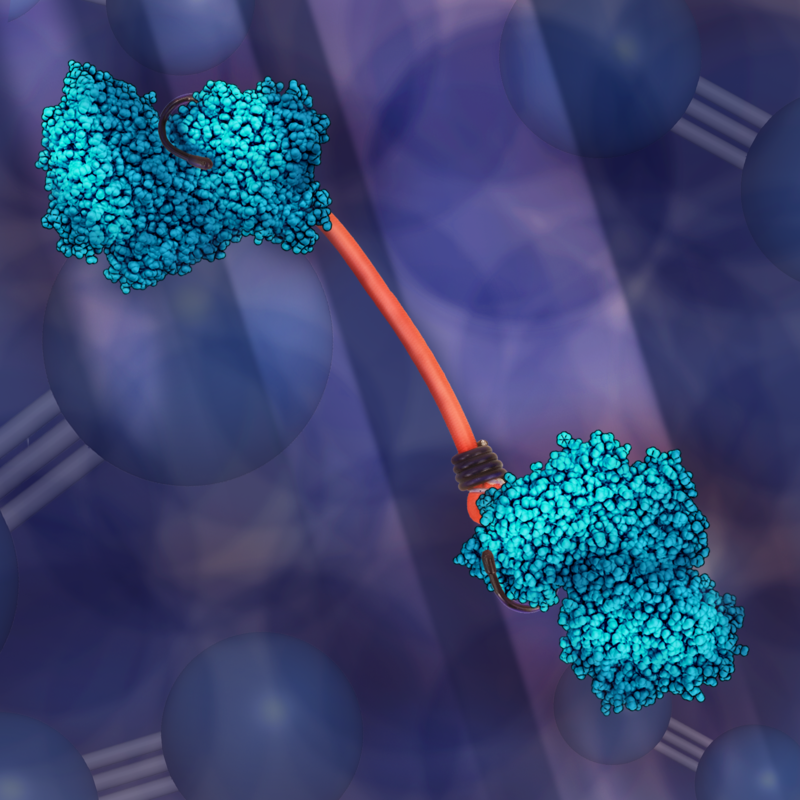 This aspect of cross-linkers is useful when examining large molecules, such as proteins, to figure out where the cross-linker is connecting the two components. While chemical cross-linking is not a new technique, recent technical capabilities have made it more available to researchers as a viable technique to study complicated reactions. Members of the Biological Electron Transfer and Catalysis (BETCy) Energy Frontier Research Center (EFRC) are using cross-linking as a means to investigate the spatial organization of protein complexes. They are also looking at how this organization helps the protein function. Scientists at BETCy have recently used cross-linking to understand energy processes in the iron (Fe) protein cycle found in several bacteria. A major question in energy production research involves the process of fixing nitrogen — in other words, understanding how the proteins in the cycle take nitrogen gas in the air and make it usable to everyone. Using chemical cross-linking and other techniques, the scientists discovered how the Fe protein interacts with the other components in this reaction. This information can be further exploited to understand some of the finer details of nitrogen fixation. Other ongoing EFRC research that uses chemical cross-linking is done by the members of the Center for Direct Catalytic Conversion of Biomass to Biofuels (C3Bio). While not analyzing protein-protein interactions, C3Bio members are studying components derived from lignin, a class of molecules often found in plant tissue, to develop thermoset materials, and examining how changing the structural properties of these components improves the sustainability and the viability of these materials. Thermoset materials include plastics that can be heated and set once; they are used for control knobs and some adhesives. Using lignin-derived components is appealing because of their sustainability. These cross-linkers are heat-reactive, and the viability of these materials is based on the extent of cross-linking. In other words, the higher density of cross-links to occur, the greater the viability of the cured thermoset materials. The density of these cross-links is enhanced by modifying the weight, orientation and number of reactive ends on the cross-links. These materials are more renewable and may have novel or more favorable properties than comparable petroleum-based thermoset materials. Chemical cross-linking’s ability to tie together two molecules and reveal their spatial relationship is quickly becoming a popular technique to answer a variety of scientific questions. This is advantageous to researchers for a number of reasons. In the case of BETCy, the spatial relationship between two (or more) proteins influences how well the reaction is facilitated by these proteins (such as nitrogen fixation), as well as how these interactions play a role in the regulation of the reaction. Alternatively, cross-linking, or, more specifically, modifications to cross-linkers, may someday yield thermoset materials made from renewable resources with unique properties and improved performance characteristics. Chemical cross-linking helps researchers understand the relationship of distance and orientation between two reaction components, and how this relationship influences a chemical reaction. BETCy: This work was supported as part of the Biological Electron Transfer and Catalysis Energy Frontier Research Center funded by the U.S. Department of Energy, Office of Science, Office of Basic Energy Sciences. C3Bio: This research was supported in part by the Center for Direct Catalytic Conversion of Biomass to Biofuels, an Energy Frontier Research Center funded by the U.S. Department of Energy, Office of Science, Office of Basic Energy Sciences (MM Abu-Omar) and by the Mellichamp Initiative at Purdue University (S Zhao). Luke Berry is a graduate student at Montana State University. He is part of the Center for Biological Electron Transfer and Catalysis (BETCy). He studies the biophysical characteristics of the proteins studied by BETCy by examining the changes in structure and dynamics of a protein using mass spectrometry to gain insight into the protein structure-function relationship. Whether hunting for a job or climbing rock faces, connections matter. Cross-linkers are an innovative way of making connections that is helping scientists answer tough questions. Researchers at the Biological Electron Transfer and Catalysis (BETCy) Energy Frontier Research Center used chemical cross-linking to measure how proteins behave. They connect one end to a protein. The other end attaches to another protein, or part of the same protein complex, if the protein is close enough. The cross-linkers only attach when they are long enough. By varying the length and the attachment points, it is possible to work out the orientation of the protein(s) when they react. But the technique isn’t just for bringing proteins together. Scientists at the Center for Direct Catalytic Conversion of Biomass to Biofuels (C3Bio) showed how, through chemical cross-linking, biomass can be used to create plastic-like materials that don’t melt once cured. These materials, called thermosets, are typically made using petroleum. Chemical cross-linking, however, can create thermosets without fossil fuels. Montana State University leads BETCy, and Purdue University leads C3Bio.